BRATHA I AM PINNED HERE! NO! I've heard a lot of good things about the Dawn of War games. In fact the original Dawn of War managed to make it at #96 on the Choicest Games Top 100. The game would serve as a solid foundation when Relic went and tackled the Company of Heroes series in 2006 and, well, the rest is history. 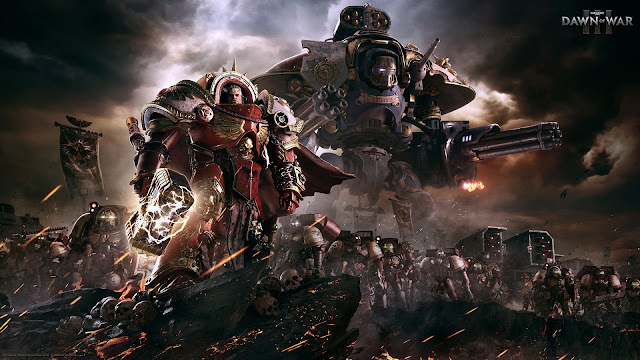 It's been a long time since the last Dawn of War game - 8 years if you consider the 2008 expansion pack for Dawn of War II called Soulstorm, but Relic have finally announced that they're doing a sequel: Dawn of War III is slated for release sometime next year. As mentioned, I've heard a lot of good things about the Dawn of War series since my first foray with a Relic RTS was Company of Heroes... well unless you count the one time I played a demo of Homeworld; this means I've never really experienced the Warhammer 40,000 setting in an RTS but Dawn of War III looks like a good opportunity to finally do so.